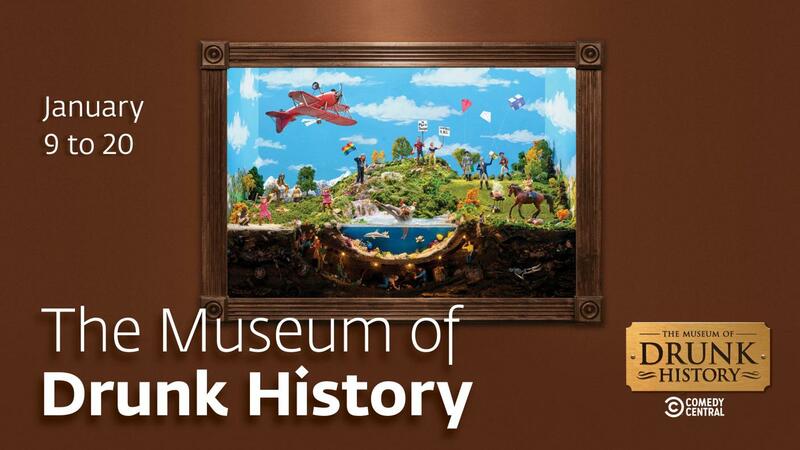 Exclusive Limited Engagement—The Paley Center for Media in Los Angeles will take visitors on a trip through the hilarious world of Comedy Central’s wildly popular television show Drunk History, when it unveils the Museum of Drunk History. Based on the popular web series, Drunk History is the liquored-up narration of our nation’s history. Host Derek Waters, along with an ever-changing cast of actors and comedians, travels across the country to present the rich tales that every city in this land has to offer. Booze helps bring out the truth. It’s just that sometimes the truth is a little incoherent. Drunk History fans are constantly talking about their favorite moments from the series, and now Comedy Central is giving you the opportunity to experience them in person. They’ve created intricate dioramas that represent each episode of the new season of Drunk History, premiering January 15 at 10:00 pm. Scenes include “The Creation of Frankenstein,” “The Occupation of Alcatraz,” and “Murderess Row”—the story that inspired the movie Chicago. The dioramas are large in detail—keep an eye out for Easter eggs! Fans who can't make it to the museum in person can check out the dioramas in new promos for season 6.